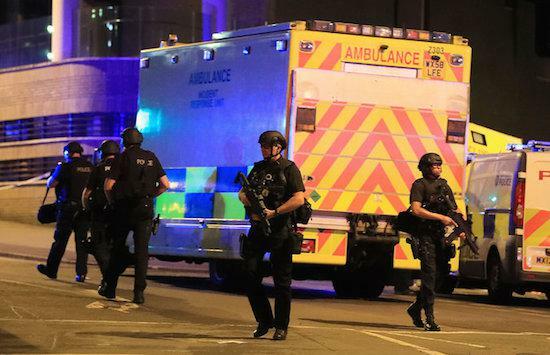 22 people have been killed and 59 injured following a suicide bombing at Manchester Arena which happened shortly after an Ariana Grande concert at the venue. Theresa May has confirmed that the explosion was a terrorist attack, and this morning (May 23) chaired an emergency meeting with intelligence officials. She added that security services believe they know the identity of the lone attacker responsible for the explosion, but did not reveal any further details. The explosion happened in the foyer area of the arena, which is Manchester's largest indoor venue. Manchester Police Chief Constable Ian Hopkins confirmed that the attacker died in the explosion and was believed to have carried out the attack with an improvised explosive device. A witness attending the concert told Reuters about the aftermath of the attack. "We ran and people were screaming around us and pushing on the stairs to go outside and people were falling down, girls were crying, and we saw these women being treated by paramedics having open wounds on their legs... it was just chaos," said Sebastian Diaz, 19. Many children were at the concert, and are believed to be amongst the fatalities. The #RoomForManchester hashtag sprung up on Twitter following the attack with those in the area offering refuge to those separated from friends and family or unable to get home following the incident. Ariana Grande tweeted a few hours after the attack: "Broken. From the bottom of my heart, I am so, so sorry. I don’t have the words."